Doing a review for Essence of Beauty Deluxe Duo Set. 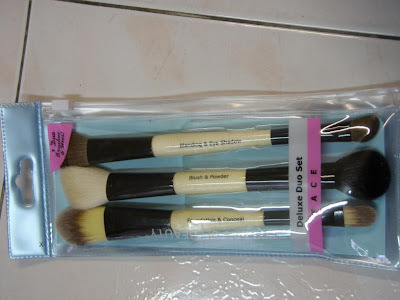 I bought this brush set earlier from a local blogshop because I really wanted another concealer brush. Not going to mention the name of the blogshop because wasn't too pleased about their service. The Essence of Beauty Deluxe Duo Brush Set contains 3 duo-sided brushes. It comes with a travel-size ziplock bag. The brushes are rather soft and nice. First impression was that I really liked the Foundation and Concealer Brush because it was the most well made out of all. The others just don't look as nice. This brush has brown bristles that are quite soft. The blending brush is a flat topped brush. It is really big for my eye area. I wasn't too sure what it was for initially because it's just too big. It can be used for applying all over eye lid colour for people with bigger eyes. It can also be used for blending out harsh edges around the crease area. I just find it to be too big for me. Doubt I'll really use this much. I really like this eyeshadow brush. It's very soft like E.L.F Eyeshadow Brush. E.L.F's regular eyeshadow brush is rounded at the top but this is angled. I like that it's angled because it goes in the crease areas so well and blends out really smoothly. Makes eye makeup such a breeze. Definitely one of my favourites. This brush has soft white bristles at one end and coarser black bristles at the other. The blush brush is small and fluffy and slightly angled. It's too small for blush application but maybe fine for precise blush application. I thought it was really nice to use this for maybe contour work. However one thing I really hate about this brush is that it stinks like crazy after washing. (Maybe I didn't dry it properly) I think the blush brush is made of animal fur. Not 100% sure but it sure smells like it. I really like this brush but it just stinks too much for me. Am not against animal hair brushes or anything but I don't really own any and have no idea how to make it not stink. Sorry if it sounds stupid. It doesn't help that it's duo-sided so it makes brushes harder to dry. The powder brush is a small domed shape brush. This side leaks dye like crazy when washed so definitely wash all your brushes before using it. It is really small so I wouldn't really use it as an all over powder brush. It is probably good for you to dust a bit of powder to set your undereye concealer or other concealers where you need setting. This brush comes with yellow with brown tipped bristles. It is good for creme and liquid application. Both sides are similiar, just difference in size. 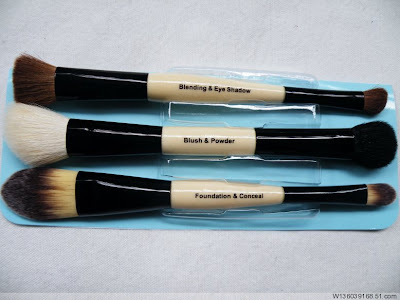 The foundation brush is big and nice tapered brush. I like that it's really thick at the sides. I don't really use liquid foundation but after testing it out, it really makes applying liquid foundation a breeze. You can get into corners around your nose and the foundation blends out really well. Would recommend this if you need a cheap and good liquid/creme foundation brush. The concealer brush is the same except it's smaller. I really like how tapered and thick it is. Really wanted to get this because of that. I have the E.L.F Studio Concealer Brush which is rounded at the top and good for cream concealer application too. But I like the Essence of Beauty Concealer Brush even more. It smoothens out liquid or cream concealer around the undereyes really nice and makes it not as cakey. You get the concealing job done so much faster too. Just dab your concealer on. You can conceal a bit first with your fingers to slightly warm it up. After that use the concealer brush to go over the area and buff it out. It softens the edges of the concealer patch hiding the dark eye circles. The same thing applies to redness around the nose, mouth so on and so forth. One of my favourites from this set. Overall I'm liking only half of the brushes from this set. The Blush and Powder Brush is my least favourite duo-sided brush out of the 3. Am prepared to throw it away because of the crazy problems it gives me. The eyeshadow and concealing brush are my favourites currently. I think this brush set's worth considering if you want to find cheap and good brushes. It's pretty decent. Maybe you can choose to buy the brushes seperately and not this particular set but am not too sure if their brushes are consistent. Duo-sided brushes probably save a lot of space but I find it kind of hard to dry them properly. Really not a fan of it. The Essence of Beauty Deluxe Duo Set retails for USD $14.99 on CVS.com.